Go to original pattern for design DROPS Children 34-13. 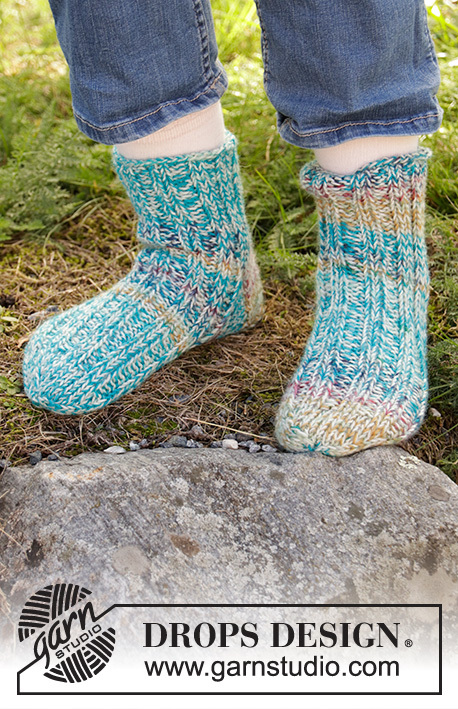 Knitted socks for children in 2 strands DROPS Fabel. Sizes 29-40. 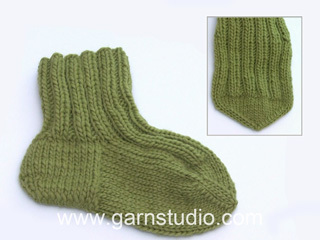 19 stitches in width and 25 rows in height with stocking stitch and 2 strands = 10 x 10 cm. ROW 1 (= right side): Knit until there are 5-5-5-5 stitches left, slip 1 stitch, knit 1 and pass the slipped stitch over, turn the piece. ROW 2 (= wrong side): Purl until there are 5-5-5-5 stitches left, slip 1 stitch, purl 1 and pass the slipped stitch over, turn the piece. ROW 3 (= right side): Knit until there are 4-4-4-4 stitches left, slip 1 stitch, knit 1 and pass the slipped stitch over, turn the piece. ROW 4 (= wrong side): Purl until there are 4-4-4-4 stitches left, slip 1 stitch, purl 1 and pass the slipped stitch over, turn the piece. Continue to decrease in this way, by working until there is 1 less stitch before slipping a stitch and until there are 10-10-10-10 stitches left. The whole piece is worked with 2 strands. 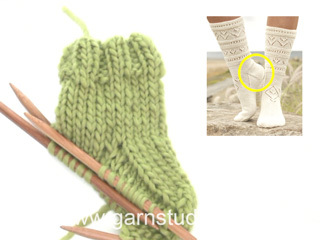 It is worked in the round with double pointed needles as far as the heel. Then the heel is worked back and forth before finishing the piece in the round. Cast on 40-40-44-44 stitches with double pointed needles size 4 mm and 1 strand off-white and 1 strand blue sea (= 2 strands). 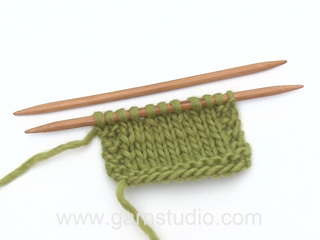 Knit 2 rounds, then work rib with knit 2/ purl 2 until the piece measures 8-8-9-9 cm. Now keep the first 18-18-18-18 stitches on the needles for the heel (the first 2 and last 2 of these stitches are knitted), place the next 22-22-26-26 stitches on 1 thread (= mid top of foot). Work stocking stitch back and forth over the heel stitches for 5-5-5-5 cm. Insert 1 marker – the piece is now measured from here! Then decrease for heel - READ HEEL DECREASE! After the heel decrease knit up 10-10-10-10 stitches on each side of the heel and the 22-22-26-26 stitches from the thread are put back on the needles = 52-52-56-56 stitches. Insert 1 marker on each side of the 22-22-26-26 stitches on top of foot. Then continue with rib over the stitches on top of foot and the remaining stitches are worked in stocking stitch - AT THE SAME TIME decrease on each side as follows: Knit twisted together the last 2 stitches before the stitches on top of foot (i.e. work in the back of both stitches instead of the front) and knit together the first 2 stitches after the stitches on top of foot. Decrease like this every 2nd round 10-9-10-8 times = 32-34-36-40 stitches. Continue with rib over the 22-22-26-26 stitches on top of foot and stocking stitch over the 10-12-10-14 stitches under the foot until the piece measures 14-16-18-20 cm from the heel marker (= 4-4-4-4 cm left). Now insert 1 marker in each side so that there are 16-17-18-20 stitches both on top and underneath the foot. 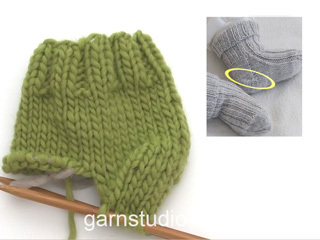 Finish with stocking stitch – AT THE SAME TIME decrease for the toe on each side of both markers. Knit 2 together, knit 2 (marker sits in the middle of these 2 stitches), knit 2 twisted together. Decrease on each side every 2nd round a total of 3-3-3-3 times and then every round 3-3-3-4 times = 8-10-12-12 stitches left on needles. 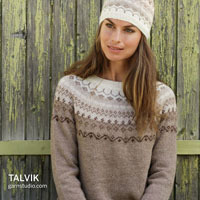 On the next round knit all stitches together 2 and 2. Cut the strand and pull it through the remaining stitches, pull tight and fasten well. Work the other sock in the same way.